Howard Phillips "H. P." Lovecraft (20 August 1890 – 15 Mairch 1937) wis an American owthor o fantasie an grue fiction, kent for giein grue stories a science feection framewark. 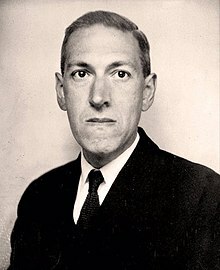 Lovecraft's readership wis leemitit in throu his life, but his warks haes turnt raither important an hanks amang scrievers an fans o grue fiction. Wikimedia Commons haes media relatit tae H. P. Lovecraft. This page wis last eeditit on 5 November 2018, at 19:10.